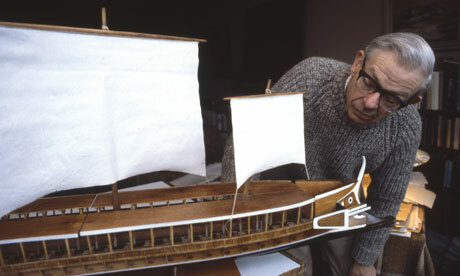 Here is the late, great John Coates admiring a large model of Olympias (pic nicked from Guardian.co.uk) : obviously he preferred 1:1 modelling but what is the best compromise between aesthetics and practicality ? Eric Hotz has produced Roman Seas in 1/300 but now appears to be answering demand from figure wargamers and is scaling them up to 15mm/10mm also. To wargame a battle in the real age of galley warfare requires the fielding of circa 100 models. Those 100 should be more than blobs and at the same time the table-top should be less than a football field. Salamis involved circa 1200 ships in an area about 4km square. 1/3600 is obviously the best solution for those of us who don't live in a castle or have unfeasibly long arms. They are about 15p each. BUT the ships and overall aesthetic is more that of a map game. They are so small that they would even perhaps have to be based as groups? 1/300 is OUT except for skirmish games. HOWEVER I like the larger ships with easily visible detail and their cheepnis. If 1/300 are reduced to 66% this gives 1/400 scale models with Salamis requiring a 10 metre table....apparently I can't have everything. Reduced Hotz ships cost me half an hour, ink, glue and card. Let's say 25p each. 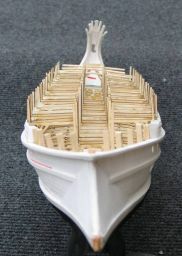 1/1200 is also a good solution BUT 100 ships means circa 400 quid in outlay, painting and weight. A funny thing is that I have not found any gamers on the net who have done some battles with c.100 ships ? Is everyone effectively doing skirmish wargaming ? even with small models ? Amazing modelling of a quadrireme -- All the better because it is made in PAPER !